Submitted by Alexander Briones on Mar. 26, 2019..
86 out of 100. Incorporating 200+ ratings and reviews. First launched in 1987, the Ibanez Steve Vai Signature Jem continues to be one of the most popular and instantly recognizable signature guitars in the world, so much so that it has grown into a line of guitars in itself. And the JemJR serves as its expansion into the mid-tier, following after the design of the original white Jem, with the same double cutaway mahogany body, monkey grip, lion's claw trem cavity, maple neck, and rosewood fingerboard with "tree of life" inlay - only this one uses more cost effective materials and production. 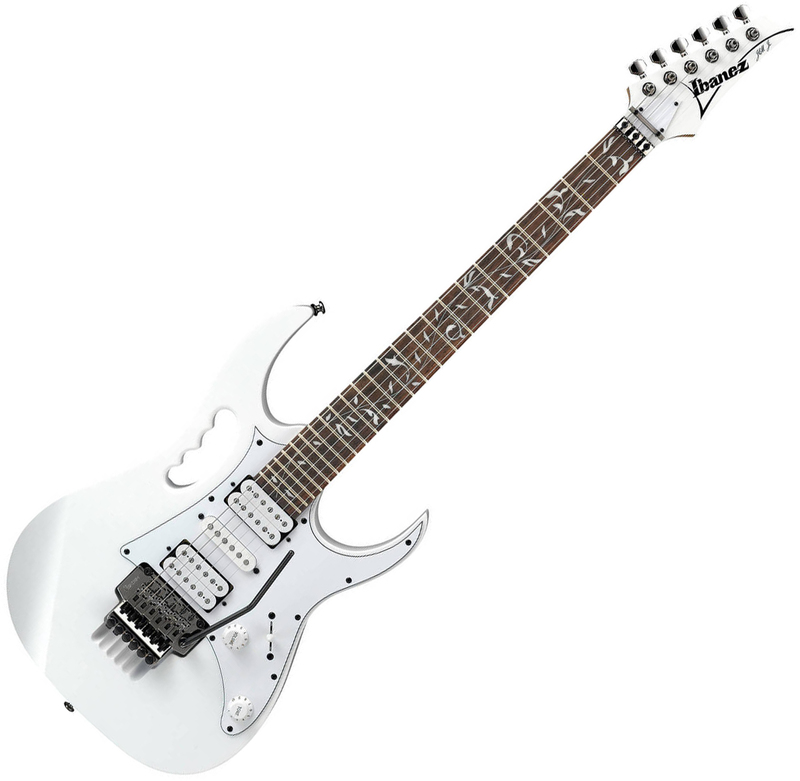 Other features include Ibanez' Wizard III neck shape, double-locking tremolo bridge and Quantum Pickups. To summarize what is commonly mentioned in majority of customer reviews, users simply find the Ibanez JemJR as a high quality and great value instrument. Even experts are impressed with its premium looks, fast playability and hardware reliability. Also the Quantum pickups are well received, with users commenting that they find no reason for upgrading the pickups because of how close they sound to Steve Vai's favorite DiMarzio pickups. Both experts and students approve of the guitar's expressive playability and tone. There are a few who mentioned having to adjust the action a bit after receiving the guitar, but all-in-all, reviewers have mostly nice things to say. For fans of Steve Vai who are looking for an affordable axe to shred with, then this is a no-brainer. But even if Vai's eclectic playing style is not your choice, and you're looking for a well rounded fast action guitar, then you should check this one out. The Ibanez JemJR Steve Vai Signature was on our recommended list until we performed a detailed review of solidbody guitars between $200 and $500 in March 2019. At that time we found there were more highly rated options using both humbucking and single-coil pickups to recommend and you can find them in our guide to The Best Electric Guitars Under $500.